A modern alpine hotel which has a welcoming mountain atmosphere along with great attention to detail and efficient service. The Oswald has been an iconic hotel of Selva for many years and once visited, guests tend to return. The elegant public areas are supported by newly renovated bedrooms. Warm hospitality and excellent cuisine is assured. Location: Oswald is situated near the centre of Selva, 4 minutes’ walk (350m) to the Ciampinoi gondola. Guests can also make use of the courtesy bus service to the lifts. All rooms have been renovated with modern décor mixed with wood-panelling and classic amenities, with bath or shower, balcony, hairdryer, satellite TV, safe, telephone and Wi-Fi connection available (pay locally). Buffet breakfast and 4 course evening meal with choice of menu, served in the main restaurant. Breakfast can be taken in the 1st floor conservatory overlooking the resort and mountains. Firstly, I must state that this is a genuine review by four very experienced skiers (two couples), who have travelled extensively across France, Switzerland and Austria, and we have skied at many of the best resorts in Europe. However, this was our first trip to the Italian Dolomites. Our holiday experience was fantastic, and we will definitely be going back! Oh, and by the way, the reps weren't bad either! O.K., local Reps were top drawer as well! Hotel Oswald in the Ski Resort of Selva Del Gardena, is probably the best ski accommodation we (Jim, Pam, Richard & Gill) have ever experienced. The very generously proportioned and immaculate bedrooms (with large balconies overlooking the mountains) had the most luxurious bathrooms imaginable. The restaurant and food were exquisite, and was so very well presented. The hotel staff (every last one of them) were unbelievably attentive. Nothing was too much trouble, and they consistently made us feel so very welcome. Hotel Oswald has a very good Wellness Centre, a state of the art ski boot room, and they run a ski courtesy bus to the resort ski lifts. The local (free) ski bus stop, is also right outside the hotel door. A four star hotel, with five star facilities and service! I have a new love! Our general preferences are Colorado skiing, but we returned to the Dolomites after a gap of about 12 years, and instantly fell in love with the area. We were wonderfully surprised at our hotel and the accommodation, although traditional in style the room and decor were maintained to a really high standard. I think you can always judge a place by its ski room - and the Oswald has a really great one with heated boot racks and kept clean and tidy. And the food! Choices and taste were fantastic, and combined with the staff, who were welcoming and friendly, made the whole stay one of the most pleasurable I have had in Europe. 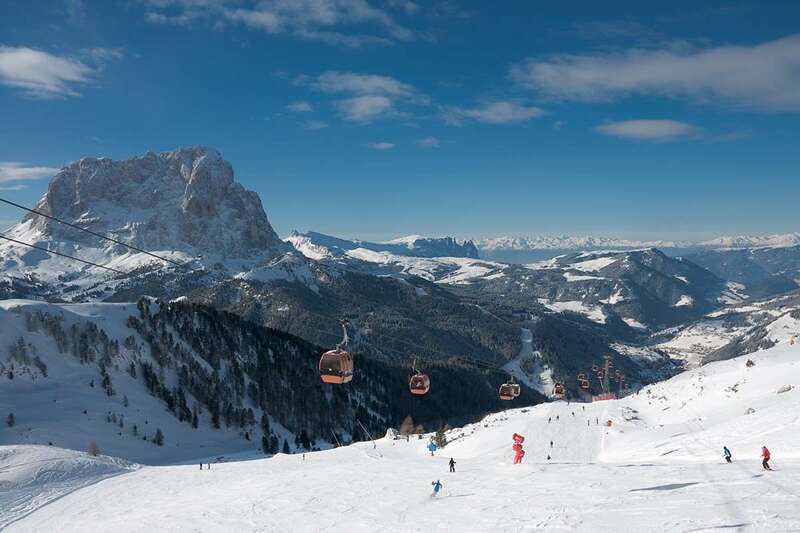 The ski area is stunning, and one of the most extensive areas to ski in Europe (the Sella Ronda) with all the resorts having some great places to ski. I would also thoroughly recommend the day trip to the Hidden Valley/5 Towers, again some breath taking scenery and wonderful skiing. We managed to ski a couple of World Cup down hill runs (at our own pace! ), the Marmolada, Sella Ronda (in both directions), Colfasco, Corvara and also Canazei. Selva itself is a quieter resort in terms of Apres Ski, but this adds to its charm as being a beautiful resort with great hotels and welcoming place to stay - and after having a great dinner every evening it was nice just to relax in the comfortable surroundings. The reps were great too...I cannot recommend this highly enough!! !